Standing in line this morning to buy food so I could make it through my three-hour Japanese class, I was casually browsing the shelves next to me in case something looked better than the melon bread in my hot little hand. At that hour of the morning, I’m usually still too brain dead to be bothered to read the packages, but this one really jumped out at me: HORUMON. Really?! 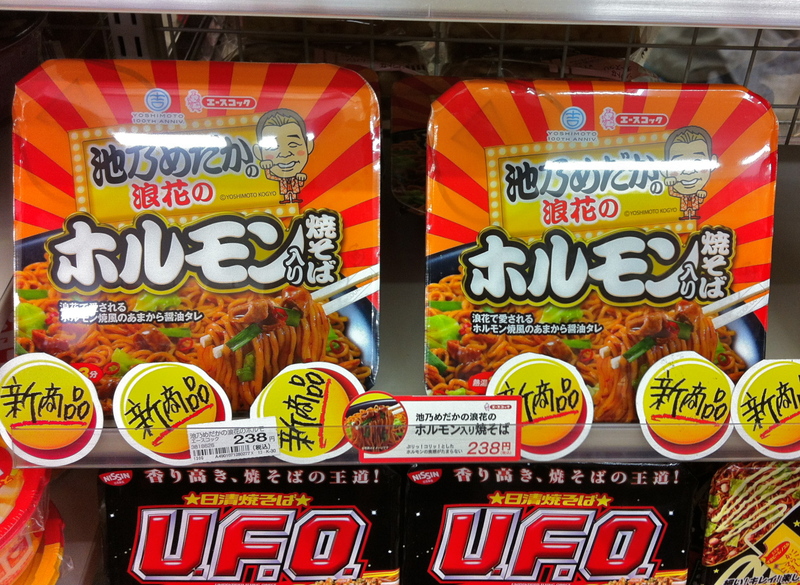 Intestine-flavored Instant Noodles? I’ll take a dozen! Not. On the other hand, to be fair, the intestines I’ve eaten here in Japan have all been prepared in surprisingly tasty ways (no, really! ), it’s just that the actual bits of intestines are a little challenging, texture-wise. But instant noodles hardly ever have actual meat in them, so maybe inside this package there’s a super-duper Extract Of Intestines packet of flavoring that delivers all the lip-smacking tastiness of horumon without that pesky rubberiness! Am I feeling lucky? Should I skip breakfast tomorrow and try some…? Japan has always come up with the most interesting flavors or meals. Hmm, yeah, “interesting” is a good way to describe it. The thing is, I bet this instant yakisoba actually tastes great. It’s just that you could never sell it in the US if it had the word “intestines” anywhere NEAR it! heh. Oh yeah, Im sure it’ll creep out or disturb people and I’m sure the FDA would never approve it or something like that… I wonder who’s intestines they used to make the flavor…? Does intestines have a flavor I wonder? I think it’s pork intestines. At least, that’s the kind I’ve eaten at restaurants. Apparently they’re really smelly before cooking (no surprise, UGH!) but they’re pretty mild and savory once cooked.